I love the quote, “Life is not measured by the number of breaths you take, but by the number of moments that take your breath away.” The past two days have been filled with those moments for me! Yesterday morning at 10:00, we finally met our Conner. 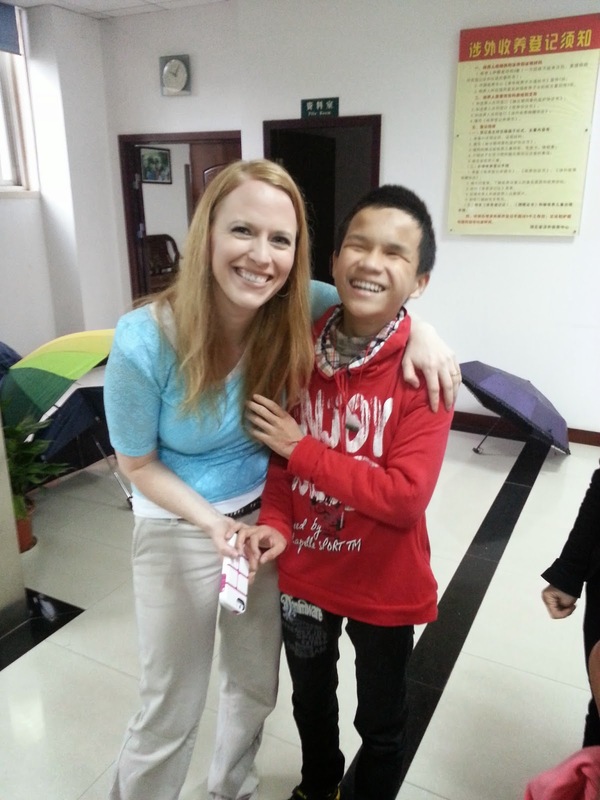 It has been over two years since we first saw his face in a video taken by another adoptive parent visiting his orphanage. By the time I was done watching the video, I had tears streaming down my face and had already dialed Jeremy’s number to tell him that I was pretty sure we had a son in China. (: My feelings about whether or not he was right for our family and whether our family was right for him have been all over the place since that moment. I have had to remind myself many times of how I felt when I first saw that video because sometimes, honestly, adding one more just didn't seem like the right thing and the thought completely overwhelmed me. After spending the last two days with this young man, I can honestly say that I KNOW that we were meant for each other. (: (: (: And it’s a good thing too, because at about 10:30 this morning, he officially became Conner Allen Green. Our son, our brother-- your grandson, nephew, cousin, and friend. We have learned so much about this sweet boy over the past two days. First of all, we have learned that his mother is smitten with him. (: Second, we have learned that he is absolutely positively THRILLED to be part of a family. I can’t count how many times he has said “I love you, Mama,” or “I love you, Baba,” or “I love you, (insert Taylor, Parker, Graci or Cali).” And we certainly can’t count the number of hugs and kisses he has given us, because they are constant. I mean, it’s in the hundreds for sure. He is the most affectionate guy I have ever known. CONSTANT affection. (This has proven to be a bit of a struggle for a Daddy that does like some personal space once in a while.) (; He has the most PERFECT smile that just lights up his whole face. He is so, so happy. So happy. I LOVE IT. The night before we met Conner, our guide told us she had a surprise for us. It was a newspaper article that had been published that day (Sunday) about Conner. It talked about what a gifted piano player he was and all of the competitions he had excelled in. It spoke of how he was the orphanage “superstar” and how some top Chinese adoption officials have given him special attention because of his talent. It told a little bit about his life in the orphanage and how he was going to be adopted by a family where both the mom and dad were accomplished piano players and how they had a piano waiting at home for him. It was so neat. Today when we were meeting with the orphanage director, she asked if we would be ok with the media being there on Thursday when we visited the orphanage. Apparently, both the TV and newspaper want to do a story on his adoption. They were worried that we would not be ok with the cameras. Jer and I kind of laughed at that, being as how we've had our share of cameras in the past couple of years. (: So of course, we said yes—but asked if we could please get a DVD of the segment. They promised that they would send us two—one for us and one for Conner. What a special souvenir that will be for him!!! They also gave us many mementos of his life in the orphanage. We received a scrapbook, professional pictures, books, and other special things. His foster mom sent him two big bags of his favorite snacks. We were told she couldn't stop crying when she said goodbye. Absolutely breaks my heart. They also gave us several very nice pieces of sheet music from his piano teacher. Apparently, he has been a student of a very prestigious music professor who loves him very, very much. This professor will be doing a concert in Washington this July, and we were invited to bring Conner if possible. We are crossing our fingers that we can somehow make that work as it is obvious how much his teacher adores him and would love to see him again. Speaking of the piano, there is a very nice one here in the lobby of our hotel. We were so excited to finally hear Conner play, but when we went over to it we were told that it could not be played. It was for decoration. Ha. I had a hard time taking no for an answer and kept pushing it to no avail. Later I went and asked to talk to someone who spoke English. I explained how we had adopted Conner earlier that day and had been waiting for two years to hear him play the piano. I asked if there was any way they would let him play just one song. The man agreed to let him play two. (: Oh my goodness, it was so incredible. He would be considered a very good pianist if he could see, but knowing that he is completely blind made it all the more impressive and beautiful. I can’t wait for him to share his talent back home. I have no doubt that he will touch many people’s lives with his beautiful music. Last night we took Conner swimming in the hotel pool. He was such a good sport. He seemed so nervous, so I asked if he had ever been swimming and he said he hadn't. It is quite a beautiful thing to be part of so many “firsts” even though he is thirteen years old. He is very easy going in many ways. He LOVES to talk and ask questions (so grateful for our guide and for Graci and Cali who can interpret) and always wants to know exactly what’s going on, but he is willing to do whatever we do, eat whatever we eat, etc. Yesterday he asked what we eat for breakfast in America. I started to laugh, knowing how hard it has been for all of my Chinese kids to adjust to American breakfast—especially because there are many days when we just have cold cereal. I told our guide to tell him what we had and that I was sorry it wasn't the kind of breakfast he was used to and he just smiled and told the guide to tell us, “It’s ok. No worries.” When he asked what our family liked to do, Jeremy mentioned we like to hike and to swim. He told our guide to tell us it was ok that he couldn't do those things because he would learn. He said to tell us he will learn whatever we want him to do. He is such a gem. I am so grateful for so many things right now. I’m so grateful for everyone who made it possible for us to get into our new home. It has already blessed our lives tremendously and now I am seeing how much it will bless Conner’s life. I am getting a sense of his spirit and I know that he is worth every moment that was spent on that house. Thank you again and again and again to everyone who was involved in that. I am grateful for Leslie, Ty and Laura, and Mom and Dad for taking care of our other sweet kids while we are gone. I know it is a tremendous task and I am just so grateful that I don’t need to worry about them right now because they are in such good hands. I am so grateful for a husband with such a generous, sensitive heart who would be open to bringing another sweet child of God into our family. Lest I have painted the picture that it is easy, I will assure you that it’s not. Conner is worth every sacrifice and struggle, and there are many. I am grateful for the absolutely amazing travel companions we have in Taylor, Parker, Graci and Cali. They have been wonderful. 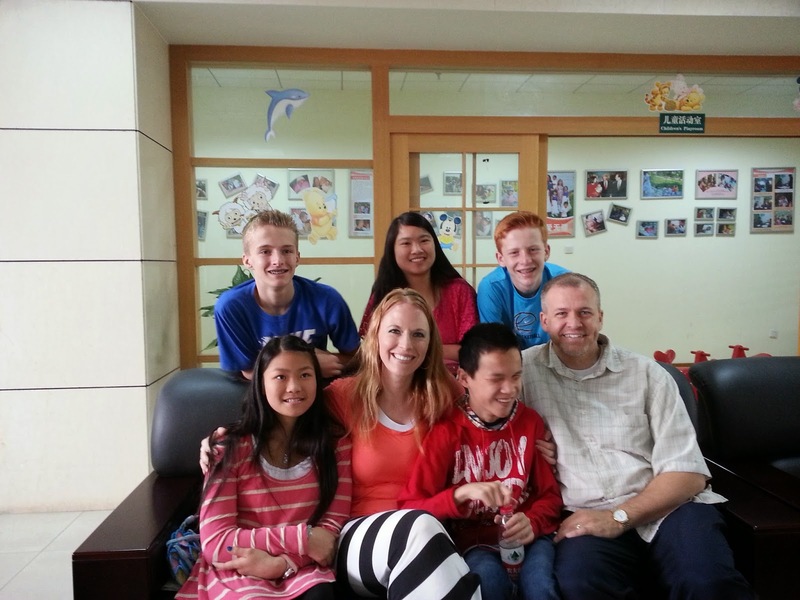 Adoption trips can have fun moments—but they are not vacations. There is a lot of work, jet lag, not-so-great food, boring times, sacrifices, etc. We are so blessed to have kids who have been stellar through it all. I am grateful for America—for the many, many, many wonderful things about it that we so often take for granted. I am grateful for China. There is much to love here. I am grateful that it has given me seven beautiful, amazing children. It has given me perspective. It has humbled me and made me aware of how fortunate I am. Most of all, I am grateful for my Heavenly Father. He has given me the perfect trials and blessings I need to make me turn to Him. I adore my Savior and am so blessed to know Him. I know the gospel of Jesus Christ is true and can bring us so much joy. I know because of Him, all of my children will someday have all that is lost in this life restored to them again. Eyes will see, legs will walk, arms will hold. What more could I ever ask for? Happy Adoption Day, Conner Green! I love you!!! Can I never read a blog post without crying? You both have such an amazing ability to bring the spirit and express love through your posts. I love Conner already! Tears are streaming down my face as I am so happy for you you! The scripture that comes to mind is that God's ways are not our ways and so when we don't possibly see how it is all going to work out Heaven Father sure does! He can see the greater picture. Congratulations! Congratulations on your new son! I hope you continue to have a safe & enjoyable experience in China. How is Cali doing? This is her 1st time back since her adoption? 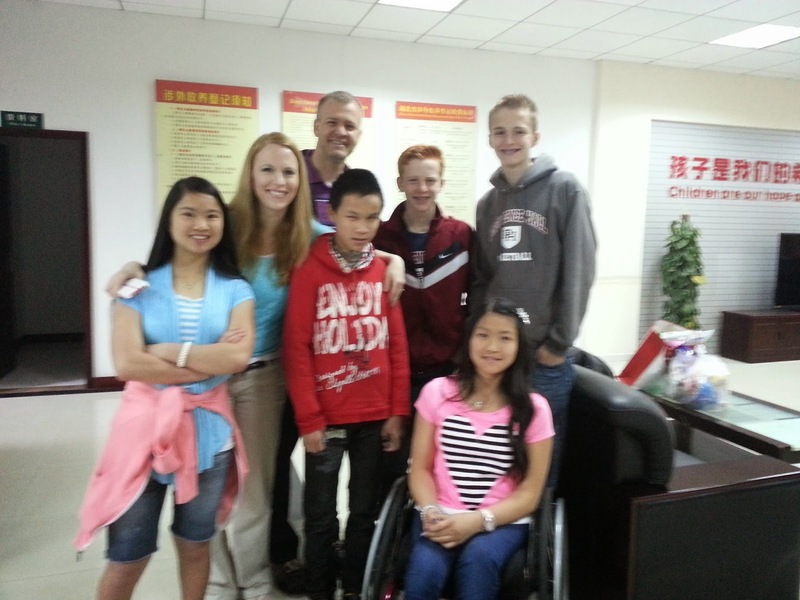 Will you get to see Graci's China family this trip? They can't wait to meet Conner!!! What a beautiful smile. What a handsome face. What amazing talent. What a blessing from Heaven! I have been telling everyone that I am a grandpa again. Mei, the Chinese teller at the Beaverton Branch of US Bank, is so excited for me. And I am so proud to be Conner Allen Green's namesake. My dad, Conard Edwin Green, must also be happy for us . . . and likely bursting his buttons, if he has any in Heaven, over this new great grandson. Tears of joy here in Mississippi! God bless you all! Crying tears of joy here! What a blessing! Congratulations Green family! Conner sounds like a wonderful addition to your already wonderful family and we are so happy for you! You have all been in our prayers. 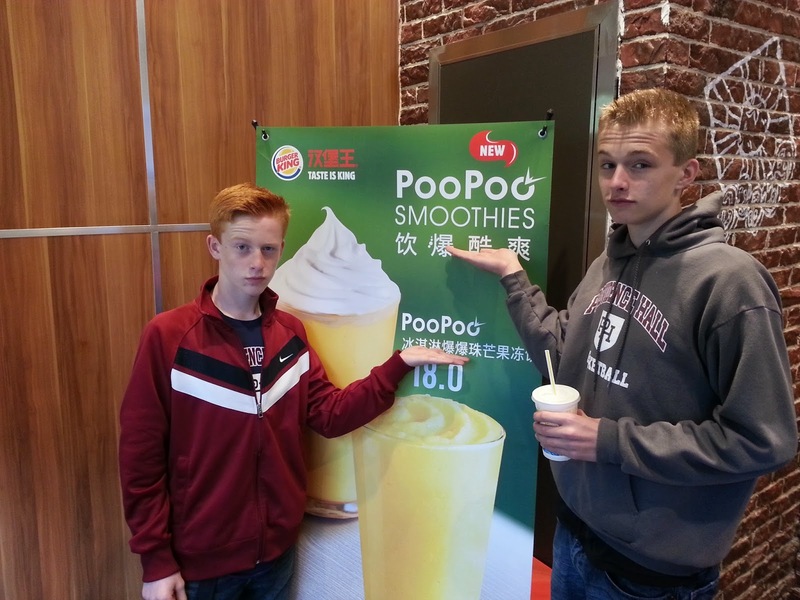 Besides the tears of joy I mentioned yesterday, I looked back at your entry today and realized I was so taken away by the happy news of Conner's adoption that I failed to satisfy my curiosity by asking whether the boys tried the POO POO smoothies. Did they? Yeah, happy news for a wonderful family. You continue to inspire and strengthen many with your faith and testimony. Thank you for sharing. So delighted for your wonderful family! Conner's special spirit shines even through photos. Congratulations! Thank you for sharing your beautiful experience. Can't wait to hear him play! Oh my gosh Christianne!!!! Love this!!! Praising Him for sure tonight! God bless your sweet hearts and God bless precious Connor!!!! Whoo hoo!!! That picture with Christ and Connor opened the floodgates. He looks so happy to have a mom!! And you both look like you're meant for each other. This is incredibly moving.